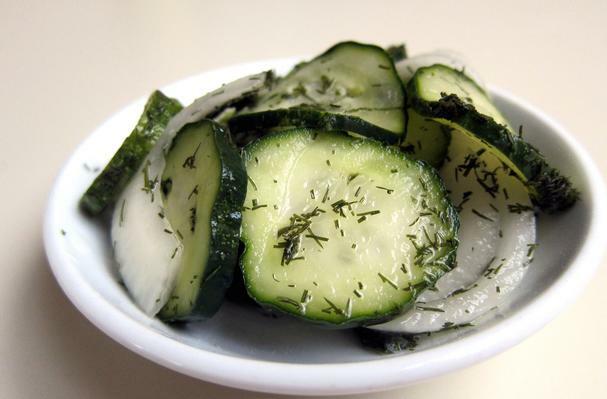 Wash the cucumbers and slice thinly. Place in a medium bowl along with the sliced Vidalia onion and remaining ingredients. Toss everything together to distribute the dill and transfer to a quart-sized zip-loc freezer bag. Squeeze any excess air out of the bag and seal well. Place the bag on a small plate in the refrigerator and flip the bag over every now and then for the first 2 days. The pickles may be eaten within a few hours or up to 2 weeks. These aren’t the old world style fermented dill pickles or the jars of pickles your grandmother may have canned in the summertime, but these may be the best dill pickles you’ve ever tasted. They are crunchy, fresh tasting and very, very easy to make. This quick recipe is perfect if you have a small garden with just one cucumber plant that happens to be a pickling variety, stumble on some at a farmer’s, or stop in one of the great Asian markets like Greenland Korean Supermarket here in Las Vegas when cucumbers are in season. Since these aren’t canned like many home dill pickle recipes, they have to be kept refrigerated and are best eaten within 2 weeks. When stored longer than 2 weeks they are still edible, but lose much of their crispness. This recipe is all about the crunch and fresh dill flavor, and the small batch makes the recipe quick & easy to manage. An interesting aspect of this recipe is the container that is used. No canning jars are needed, just quart-size zip lock freezer bags, but after a day or two in the bag, the pickles and the brine may be transferred to a jar, if desired, to save shelf space in your refrigerator. Even more interesting is the type of vinegar and style of dill that is used. This recipe calls for tarragon vinegar for it’s milder, more interesting flavor. It also calls for dried dill. Fresh dill will discolor and turn an unappetizing shade of brown here. The recipe below makes a one quart bag. The recipe can be doubled, but I recommend sticking to the one quart sized bags, just for the sake of convenience. The onions in the recipe are optional, but are ever so good served on hamburgers and hot dogs, or just as they come out of the bag as an interesting accompaniment for BBQ chicken or grilled steaks.